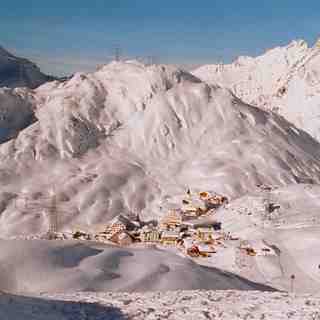 Is it snowing in St. Christoph ?¡Gracias! Light rain (totál 8.0mm), mostly falling el martes por la tarde. Very mild (max 10°C el lunes por la tarde, min 3°C el domingo por la mañana). Wind will be generally light. Mild at first with light rain (totál 5.0mm) el miércoles por la noche followed by colder weather and light fall of snow, heaviest el viernes por la mañana. Freeze-thaw conditions (max 10°C el miércoles por la tarde, min -4°C el viernes por la noche). Wind will be generally light. La tabla anterior muestra el pronóstico de tiempo para St. Christoph en la altitud específica de 1906 m. Nuestros modelos meteorológicos sofisticados permiten prever pronósticos para la cumbre, la mitad y la base de St. Christoph. Para aceder a los pronósticos de tiempo a otras alturas, pinche en la navegación en la parte superior de la tabla. Para una visión general, consulte el Mapa meteorológico de Austria. Nombre de la estación también escrito como St Christoph. Stayed at the Inghams St Christoph Chalet Hotel, ticks all the boxes if you just want to eat, ski, eat, swim, eat, sleep. Very comfortable rooms. This is not a true village, there are no footpaths or shops other than skiwear/ski hire. Ski school is adjacent to ski room, along with T-Bar lift to start your day skiing. The chair lift up to the top has a cover - great for keeping warm first thing in the morning. The skiing and apres-ski on the mountain is amazing but buses back to St Christopher are only hourly so opted for catching the last lift up. Taxis from St Anton are 22 euros before 7pm or 33 euro after. The weather can be a few degrees colder up at St Christopher so head down to St Anton if you prefer it warmer and wrap up if taking the cable car up to Valluga. We were there the first week in April and even in the spring skiing conditions we still were able to ski down to village levels (very heavy going at end of day though). Top ski area will return for sure.